That this recording is the first to concentrate on the sacred music of Dominique Phinot is a reminder that a significant amount of music composed in the early sixteenth century continues to be terra incognita to present-day audiences. Moreover, our knowledge of the lives and careers of composers at this time is often based upon little more than fragmentary evidence. Information about Phinot’s career, for instance, is confined to a handful of documents from the 1540s and 1550s which indicate that he was a musician in the service of Duke Guidobaldo II of Urbino. A memorandum of 1544 records that he was proposed by the Duke for the post of ‘cantor’ (singer or choirmaster) at the cathedral in Pesaro. Since all of Phinot’s works received their first printings during the period 1538–1555, the composer is likely to have been in his late twenties by the first date, in which case he would have been born around 1510. From Girolamo Cardano’s essay Theonoston, which implies that Phinot was executed for homosexual practices, we learn that his death occurred before 1561. 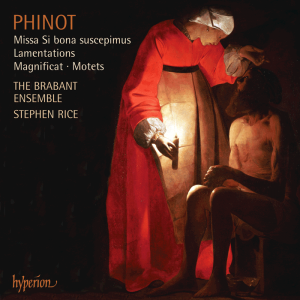 Phinot’s output consists of over a hundred motets, two Masses, and settings of Vesper Psalms and the Magnificat, as well as two books of French chansons and two Italian madrigals. The acclaim with which his sacred compositions were received is evident both in the frequency of their publications as well as in the writings of his contemporaries. He was renowned as a master of imitative polyphonic writing, a trait which he shares with Gombert, Clemens non Papa, Willaert, and others of that generation who were the successors of Josquin Desprez. Indeed, the theorist Hermann Finck in 1556 placed Phinot behind only Gombert, Clemens, and Crecquillon (and ahead of Willaert) in a list of composers he described as ‘foremost, most excellent, subtlest and, in my judgement, to be imitated’. The publication in Lyons during 1547–8 of two collections of Phinot’s motets secured his reputation for the rest of the century and beyond. Not only do the five-voice motets in the Liber primus mutetarum confirm his outstanding polyphonic skills but the Liber secundus contains five eight-voice works which are of considerable historical importance. The latter are unique in the mid-sixteenth century in their treatment of double-choir dialogue, a technique in which two four-part ensembles normally alternate thematically related phrases of varying lengths. These works, of which four are included in this recording, are the antecedents of the resplendent Venetian polychoral tradition of the late sixteenth and early seventeenth centuries. In his eight-voice sacred works Phinot builds upon those essential features of double-choir technique which first appeared in the liturgical music of northern Italy, mainly in the Veneto, during the early decades of the sixteenth century. Psalms and canticles, which had for long been associated with ritual antiphonal performance, frequently inspire double-choir settings by composers such as Ruffino d’Assisi (fl1510–1532) and Francesco Santacroce (1488–1556), who already exploit varied lengths of choral exchange, contrasts of high and low register between ensembles, and chordal writing, in order to create genuine double-choir dialogue. When we listen to Phinot’s double-choir motets and Lamentations, it is soon apparent that the composer’s main objective is to create musical structures rather than to respond to a liturgical requirement. By far the largest of these isIncipit oratio Jeremiae prophetae, a multi-sectional as well as polychoral composition. Phinot departs from the standard practice of Renaissance Lamentation settings in not composing music for the Hebrew letters that begin each verse; rather, the four middle sections comprise a continuous narrative of the first eight verses of the book’s fifth chapter. Phinot contrasts an upper-voice section (‘Pupilli facti sumus’) with a lower (‘Cervicibus minabamur’), creating an alternative division of the eight voices to the usual one between two SATB choirs. His control of the sonorous possibilities of eight-part writing is seen most effectively at the beginning of the final narrative section (‘Patres nostri peccaverunt’), where the full choir returns in force after the two reduced-voice sections. The other double-choir motets included here are less ambitious in scope but scarcely in technique. Perhaps the most purely beautiful among them is the Communion motet O sacrum convivium, which creates a serene mood of contemplation in which phrases are passed between the two choirs before being repeated by the full ensemble, as if each aspect of the Eucharist is presented, discussed and finally reaffirmed by a congregation. Tanto tempore, in contrast, is more austere, seeming to embody Jesus’s disappointment that his disciples do not recognize him: even the concluding Alleluia is tinged with regret. Finally, Iam non dicam vos servos returns to the narrative style of the Lamentation, presenting forthright words of Christ encouraging the disciples to accept the Holy Spirit. One of the most controversial theories surrounding the performance of Renaissance polyphony is that of the so-called ‘secret chromatic art’. First proposed by the scholar Edward Lowinsky (1908–1985) in relation to motets by Jacob Clemens non Papa, it holds that certain pieces could be performed with the addition of numerous accidental flats, sometimes leading to the entire piece ending a semitone lower than it began through a process of transposition. Lowinsky hypothesized that this related to crypto-Protestant significance in the music: Clemens’s mysterious nickname ‘non Papa’ would in this case indicate anti-Papal leanings—though more recent research suggests that Clemens was so called for much more prosaic reasons to do with his debauched lifestyle. Whatever the background to this phenomenon, it is certainly the case that in several pieces of this period, if the rules of musica ficta are followed as most likely would have happened in performance from separate partbooks, one flat after another appears in the music and leads to a downward spiral. One such example is Phinot’s Pater peccavi, a motet based on the story of the prodigal son. The first half of the motet proceeds in a contrapuntally unproblematic way; only when the son begins to describe his miserable circumstances (‘hic fame pereo’) does the modulation begin, achieving the entire shift in an extraordinary passage a little over half a minute long (3’45” to 4’20”). Having so to speak ‘found his feet’ in the new tonality the son resolves to go back to his father to beg forgiveness (‘Surgam et ibo’), but the pain of his humiliation is underlined by the highly expressive downward sequence of suspensions (‘et dicam ei’) before the plea ‘Make me as one of your servants’ (‘Fac me sicut unum ex mercenariis tuis’) returns in a mood of resignation. Such a direct narrative explanation may seem out of place for a motet published as early as 1538; yet the remarkable effect both of the ‘secret chromatic’ spiral and the later suspension passage suggests just such an interpretation despite the early date. In basing a Mass on Claudin de Sermisy’s motet Si bona suscepimus, Phinot followed convention to a much greater extent than in the pieces discussed above. Yet even here expressivity is to the fore: Sermisy’s is one of a large group of settings of this extract from the book of Job, which evidently appealed to sixteenth-century composers for the pathos of its text. The formal plan of Sermisy’s motet is unusually sectional for the period, with several internal repetitions which combine with heavy use of homophony to add weight to the sentiments of the text. Most of the melodic phrases are set in ‘pair imitation’, for instance at the opening of the piece, where the top two voices sing a phrase in two-part counterpoint, which is then repeated by the lower two, with or without additional decoration. This technique was beloved of the preceding generation of composers: Josquin Desprez, and composers active in Milan such as Loyset Compère, are especially known for it. By the 1520s when Sermisy’s setting was presumably composed, this was a slightly archaic device, which combines with the frequent pauses such as those between ‘Dominus dedit’ and ‘Dominus abstulit’ to add poignancy to the suffering of Job. In Phinot’s Missa Si bona suscepimus these characteristics are exploited frequently: perhaps the most noticeable device is the use of Sermisy’s repeated phrase ‘sit nomen Domini benedictum’ at the ends of movements. Some of Sermisy’s sectionalization survives here also: even though the Mass is short by contemporary standards, the Gloria and Credo are divided into three and four sections respectively, with reduced voices for ‘Domine Deus’ (no bass), ‘Crucifixus’ (no tenor or bass), and ‘Et resurrexit’ (no soprano). However, Phinot also exceeds his model in introducing long melismas that are not found in Sermisy; thus he avoids the pitfall of extending the mournful text-setting of the motet to the entire Mass, much of which is joyful or even ecstatic in nature. The form of the Vesper Psalm is in some ways less glamorous than for instance double-choir motets, but certainly more central to the lives of sixteenth-century church-goers. Confitebor tibi, Domine was one of the most frequently chanted Psalms, which would have been known by heart to the musicians: Phinot’s setting to the third tone follows the plainsong closely in the top voice of the polyphonic verses. A notably harmonic twist is the beginning of verse 9 (‘Sanctum et terribile nomen eius’), where an explicitly indicated flat in the bass part causes the music to move suddenly into uncharted territory: unlike in Pater peccavi, however, it quickly reverts to the chant reciting note. The eighth-tone Magnificat setting is constructed on similar lines, though exhibiting a greater degree of freedom in paraphrasing the chant. Verse 5, for example (‘Et misericordia eius’) is imitative rather than chordal, and a strong contrast is effected between verses 7 (‘Deposuit’) and 9 (‘Suscepit Israel’). The final polyphonic verse expands the texture to five voices, with a canon at the upper fifth between the tenor and the added voice: the soprano part, too, is almost all canonic at the octave with the tenor, requiring only a single amendment so that its second note is consonant with the lower voices.